Our founder started Baan Unrak with the vision of the tremendous potential hidden within each and every child. She felt that it was a crime to society to let it go to waist. That was why she could not say no to any child that needed her help. Baan Unrak was thus born as a … Continue reading "A Place of Learning"
It is a dream that has come true! For many years we have been struggling just to ensure that we have sufficient water at Baan Unrak. Now, not only do we have water but we have fresh, pure, clean water. It came through the kindness of one of our volunteers. She felt connected with us … Continue reading "Fresh and Clean Water"
Baan Unrak hosted the junior high students from the community, Baan Unrak, Baan Dada and Children of the Forest for a seminar that took them out of school and participating in a fun filled two days of workshops. A long time social worker for the community, Saikama, ran the entire program. The first day was all … Continue reading "Health and Agriculture Workshop"
School has started again! The first day of school is always exciting. We are getting the kids back into a normal routine. Which is always a nice change by the end of their summer break. The kids have now started back in on their morning routine. Getting ready for the beginning of the year is … Continue reading "Going Back to School"
Every year a group of children with volunteers take a summer vacation in Rayong. This is a trip that the children look forward to and start to get excited during the planning process. Two volunteers, Louise and Pavitra, were the volunteers that put the trip together and brought the roughly thirty children on their yearly … Continue reading "Rayong Trip"
This summer DiDi took 17 children to Bangkok for a fun getaway. They were able to perform their yoga dance routine five different times for several different audiences and sponsors. This is always a great treat for the children. They love the opportunity to showcase their talents. As well as the ability to practice in … Continue reading "Bangkok Performance"
A wonderful day was spent with University students this week. 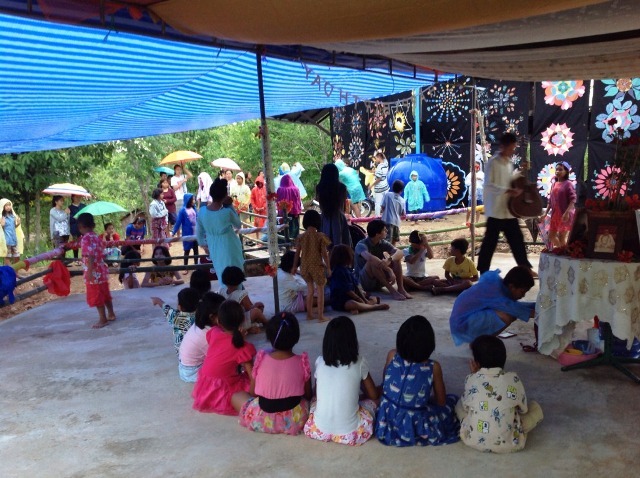 They arrived at Baan Unrak for a day long retreat with the children. They were all from Mahidol University the Kanchanaburi Campus. It was a very hot day so perfect for keeping the kids occupied and their minds off the heat with fun activities. They … Continue reading "Visit from Mahidol University"